Here’s a screen grab from the Osaka Ya video. It shows the unidentified gunman seconds after the murder of Jason Wei. The entire tape released by police shows the gunman in four different locations at the restaurant including entering through a back door, storming through the kitchen, threatening employees and customers, and takign about $200 in cash from a register. There is never a clear shot of the gunman’s face. There is no sound on the video, but you can clearly see the reaction of one woman at the moment a shot is fired. This was the scene outside the home where Oscar Garcia was shot Monday nigh tin Baldwin Park. 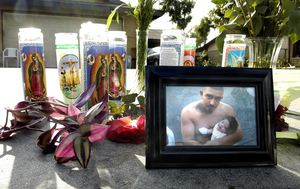 The photo in the foreground depicts Oscar and his four-month-old son Oscar Jr.
Baldwin Park Police have no leads in the case, and say the shooting wasn’t gang related. I’ve been putting together a database of area homicides in 2007. It’s not perfect yet, but I thought a limited rollout in a blog post might reveal any bugs. Give it a test drive and let me know what you think. A resident of Waco Street in Baldwin Park shot some gruesome video in the aftermath of Monday’s murder. We just completed reviewing it. Apparently police, sheriff’s detectives and coroner’s investigators had no idea they were being filmed. If anything, the video is a real world look into real-life CSI. The video begins with a shot of the victim’s body laying on a driveway. Later on detectives crowd around, while a coroner’s investigator apparently checks the victim’s pockets, feels for wounds and takes a liver temperature. The victim is then lifted onto a gurney and another examination is conducted. Most of this was done in plain view of the camera. The video concludes with a brief look at the victim’s family, who have just learned their loved one was shot. This came in an email. we have zip for details and even less knowledge about the accident. Glamis that killed 2 siblings from Glendora and another teenager from Norco????? Reports from Whittier indicate one teen was killed and another wounded in a shooting near the intersection of Orange Drive and Redman Avenue around 9:30 p.m. Whittier PD. is handling the case. A car described as a four-door sedan was apparently associated with the shooters. Police say there are witnesses. It is unclear if the witnesses are cooperating, Whittier PD said. Whittier homicide detectives will handle the investigation. [BODY]WHITTIER One person was killed and another wounded in a shooting Monday, officials said. The victims names were not available, however they were both described as appearing to be in their late teens, said Whittier police Lt. Wyatt Powell<NO1>cq<NO>. The shooting occurred about 9:30 p.m. on Orange Drive at Redman Avenue, said Powell. The victims were standing near the intersection with at least one additional person when a 4-door sedan approached, Powell said. The car parked to the west of where the group of victims was gathered, exited the vehicle, and opened fire, said Powell. One of the two struck by gunfire was pronounced dead at the scene, he said. No further details about the deceased were known. The other victim, a local resident, was taken to the Los Angeles County/USC Medical Center in unknown condition, Powell said. Multiple calls reporting the shooting were received, and police interviewed several witnesses, said Powell. A motive in the shooting remained under investigation late Monday, he added, and a suspect description was not immediately available. Anyone with information about this crime should contact the Whittier Police Department at (562) 945-8250. BALDWIN PARK An unidentified man was shot and killed Monday night in the 13100 block of Waco Street, officials said. The dead man was a male Hispanic, according to Los Angeles County sheriffs Deputy Maribel Rizzo, of the sheriffs Information Bureau. The victim was pronounced dead at the scene. Baldwin Park police officers set up a brief containment of the area following the shooting but were unable to locate suspects. The shooting is the third homicide in Baldwin Park in the past 10 days and the 78th in the San Gabriel Valley in 2007. If you click on the icon it will provide a timeline of the early response as we knew it Monday night. Looks like this one happened about 8 p.m. on the east side. BPPD is deferring calls to the Sheriff’s Department, which hasn’t even received a dispatch on the case yet (now 9:08 p.m.) Approximate location is Fairgrove and Mangum streets (almost Bassett turf). This would make three murders in 10 days in Bolen. Things are getting hot…. [BODYRR]<CF12>WEST COVINA</CF> A West Covina man was shot and killed in a residential neighborhood Saturday, officials said. The victim, described as a 23-year-old Latino man, was not identified Monday pending notification of his next-of-kin, said Los Angeles County Department of Coroner Lt. Fred Corral<NO1>cq<NO>. Someone phoned police about 9:45 p.m. to report hearing gunshots in the 1400 block of Larkwood Drive, said West Covina police Lt. Ron Mitchell<NO1>cq<NO>. Around the same time, another caller reported seeing what appeared to be a dead body out in the street, said Mitchell. The victim suffered three gunshot wounds and was pronounced dead at the scene, Mitchell said. Though police received several conflicting witness accounts, said Mitchell, investigators have no concrete suspect information to work with. One witness described three suspects in the area at the time of the shooting, Mitchell said, while another reported only seeing one. One witness saw a possible suspect vehicle, while another said there was none, he said. Mitchell did not immediately know if the shooting was gang related. The story indicates this is a fairly residential area. I’ll get a Google Map up later. Additionally, sources tell me the dead man’s identity is Luis Martinez, 23, of West Covina. Arcadia: Jason Wei, 42, an Asian-American man, was killed by gunfire during a restaurant robbery at 815 W. Naomi St. in Arcadia at about 9:24 p.m. Nov. 25. 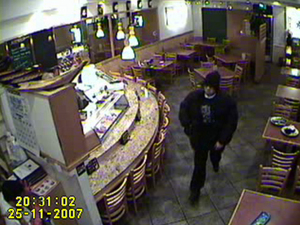 Arcadia Police Lt. Larry Goodman said a Latino suspect dressed in dark clothing with a dark beanie came into the Osaka Ya sushi restaurant where Wei worked, and took money from the cash register. The restaurant was still open; a few customers and other employees were inside. Goodman said they offered no resistance, and the suspect simply shot Wei for unknown reasons and fled. He was taken to a nearby Methodist hospital where he died. 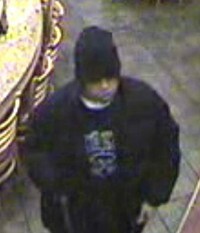 Arcadia police are looking for information on this case. Det. John Bonoma is at (626) 574-5166. An Arcadia police watch commander whom I spoke to this afternoon couldn’t help with further details. He referred all questions to the homicide detectives who are not in the office late on Monday nights.